Legally speaking wines with different levels of alcohol have a specific legal name, these are:. To be classed as a wine, wine must have a minimum alcohol level of 8.5% except some German wines which are allowed to be as low as 6.5%abv. ABV is Alcohol by Volume. There are a number of ways of achieving wines with low alcohol. But some wines are naturally low. For example, wines from countries near 50 degrees latitude, where the amount of energy from the sun is low, often have naturally low sugar levels. This converts to low alcohol levels during fermentation. 10-11% ABV is very common for countries such as England and Germany. Often these cool climate wines have a racy acidity and this can be tempered by leaving some sugar unfermented. This hides the acidity and the unfermented juice helps to reduce the alcohol. In fact, unfermented sugar in sweet wines is the easiest way of managing alcohol levels. Wines such as Moscato D’Asti with its 5.5% alcohol are an excellent example. The wines have a potential alcohol if fermented to dry, of 10%. Other less extreme versions include Asti Spumante and many top dessert wines, where the sugar levels are more important than the alcohol levels. There are other ways of reducing alcohol in wine. The easiest is to simply add water to the wine diluting the alcohol levels. This practise is frowned upon in Europe, but in America where alcohol levels can be excessive in some regions it is not uncommon. Whatever method that is used, wines with their alcohol levels reduced or removed leaves the wine in a less stable state, as such these wines need to be treated with an extra effort in hygiene standards to ensure the wine is in the best condition possible. A spinning cone is a form of steam distillation to extract volatile chemicals such as alcohol and flavours from wine and other foodstuffs while minimising the effect on the taste of the product. To visualise it imagine a tall round cylinder, inside is a series of upside down cones connected to a central shaft that is spinning around. Between these spinning cones is another set of cones, this time connected to the stationary outside wall. 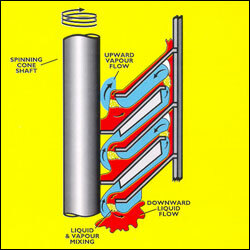 The liquid comes in at the top and, through centrifugal force, pushes the liquid up the cone towards the outside wall. The spinning spreads the liquid evenly and creates a large surface area. Once the liquid reaches the tip of the cone near the stationary wall, it flows over the side onto the stationary cones connected to the wall sliding down under gravity. Near the bottom it drips off the stationary cone connected to the wall, back onto another spinning cone connected to the central shaft. Once again centrifugal force pushes the liquid up and out again. This process is repeated a number of times. While this is occurring steam or other solvents enter the bottom and wind themselves between the cones, eventually coming out the top. As the steam or solvents rise through the cones, they pick up volatile aromas and/or alcohol. In California, where more than 200 spinning cone columns are in operation to remove alcohol, it is a two step process. Firstly a portion of the wine to be treated is separated and passed through the spinning cone column to remove the delicate aromas in the wine. These are saved and put aside. The remaining wine is then passed through again, this time stripping the alcohol. The de-alcoholised wine and the flavour from the first pass are then blended and added to the remaining untreated wine, giving a finished wine with lower alcohol but no loss of flavour. Other methods of alcohol reduction such as evaporation or filtration cause the loss of many vital flavour compounds and require a far greater volume of wine to be processed. The key advantages of the spinning cone is that it is fast at less than 20seconds inside the spinning cone, resulting in very low thermal damage to the wine. Also because of its high efficiency only around 20% of the wine needs to be processed to reduce the alcohol levels by 1% abv. Formally, Reverse Osmosis as it applies to removing alcohol is the process of forcing alcohol from a region of high alcohol concentration through a semi permeable membrane to a region of low alcohol concentration by applying a pressure. Functionally, it is rather more simple than the name implies. In normal filtration wine is pressurised and forced through a membrane that has a set hole size to exclude molecules and particles of a particular size. Reverse osmosis is a cross flow, where the wine passes parallel to a filter, helping to limit clogging of the membrane. The wine is at pressure and the pressure forces, in this case, alcohol and water through the pores. The remaining wine is returned to the tank. The alcohol and water can be separated using distillation with the water added back to the wine if desired. Like the spinning cone, not all the wine needs to be processed with typically less than a quarter of the wine needing to be processed to reduce the alcohol. Reverse Osmosis can be used to remove water from the grape must, effectively increasing the concentration of all other components making for a more concentrated wine. It has also been used to remove unwanted flavours from some wines, such as Brettomyces or smoke taint as well as helping to cure some stuck fermentation when acetic acid gets too high. Its' most common use in the world is in desalination plants where the removal of salt from water is required. If Reverse Osmosis is simply a cross flow filter why the complicated name? Well it is the opposite of what is called osmosis. Lets look at an example using alcohol. When the membrane has a volume of pure water on both sides, water molecules pass in and out in each direction at the exact same rate; there is no net flow of water through the membrane. However, if one side now contains alcohol and water, and pure water on the other, the membrane is still hit by molecules from both sides at the same rate. However, some of the alcohol molecules hitting the membrane will not pass through the membrane. So water molecules pass through the membrane from this side at a slower rate. This will result in a net flow of water to the side with the solution. A wine example of osmosis is if a yeast cell is in a super high concentration of sugar. Water will flow through the cells membrane to the sugary water dehydrating the yeast cell and killing it off, and is the reason why it is so hard to get super sweet wines to ferment, and why they don’t spontaneously start fermenting if any yeast molecules are left in the wine. It is the same for salting meat. Water naturally flows to a solution with alcohol, salt, sugar etc. Reverse osmosis is the opposite of this. We are removing alcohol from a water solution not adding water to it. Jacob’s Creek is planning to lower the alcohol level of its wines to not more than 14%. UK alcohol consumption is falling at the fastest rate for more than 60 years according to HM Revenue & Customs data released by the British Beer & Pub Association (BBPA). At the same time that the Government is encouraging us to drink responsibly, a range of reduced-alcohol wines has been prevented from going on sale in the UK. Above average rainfall across Australian vineyards will help rebuild water levels during a long period of drought. Plans by the Scottish government to introduce a minimum price for alcohol and increase the alcohol buying age to 21 have been put on hold for at least a year. Two low-alcohol wines have been prevented from going on sale by the Food Standards Agency, which says they are illegal because they use ‘artificial’ winemaking practices. The Scottish Government has announced plans to set a minimum price for alcohol and ban alcohol promotions. Supermarkets have been criticised for selling alcohol at below-cost price by the Royal College of Physicians, which it believes is bad for the public’s health. The UK government has raised the duty on alcohol by 2% in this year's budget. World Health Organisation (WHO) has agreed a plan to develop a global strategy to reduce the harm caused by alcohol. Revenue from alcohol duty is at its lowest level for a decade. The alcohol industry is not following its own code of conduct, according to research done by KPMG. Boris Johnson has announced plans to ban alcohol on the capital’s public transport network. Three-for-two and other multi-buy discounts on alcohol are to be outlawed in Scotland as part of the country’s crackdown on binge drinking. Drinkers who live in the North of England are more likely to binge on alcohol and die younger than their southern counterparts. A study by Norwich Union, the UK’s leading life and critical illness insurance provider, has found that nearly a quarter of people lie about their alcohol intake. A Tesco shopper has fallen foul of new guidelines which support the government's Think 25 responsible drinking campaign.